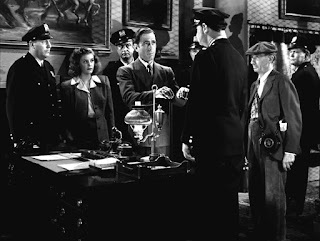 A jaunty thriller, All Through The Night mixes laughs with action in a story of a New York gambler tangling with a Nazi terrorist cell. 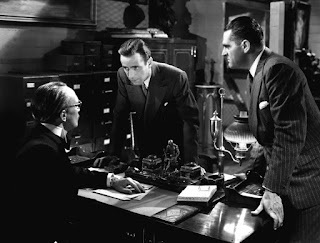 "Gloves" Donahue (Humphrey Bogart) is prodded by his Ma (Jane Darwell) to investigate the murder of popular cheesecake maker Mr. Miller. Along with his sidekicks Sunshine (William Demarest), Barney (Frank McHugh), and Starchy (Jackie Gleason), Gloves starts to investigate Miller's mysterious customer, the alluring singer Leda Hamilton (Kaaren Verne). Soon another murder is committed, and this time Gloves is falsely implicated, forcing him to delve deeper into the plot to try and clear his name. Gloves: [Breaking into a building] Personally, I'd feel more comfortable if I had a rod. Sunshine: Here lies Sunshine under the sod. That's not odd. He had no rod. Gloves: You know, there are times when I wonder about you. His pursuit of Hamilton leads him to an auction house used as a front by a Nazi terrorist cell commanded by Ebbing (Conrad Veidt) and assisted by Madame (Judith Anderson) and their enforcer Pepi (Peter Lorre).With the cops on his tail, Gloves has to infiltrate the terrorists before they can launch their latest elaborate bombing plan, all while deciding which side Leda is really on. Ebbing: You're not afraid to die, are you? Gloves: I don't mind dying, but I hate to be divided up into small pieces. Any wartime film that tries to add levity to a raging conflict where the outcome is still in doubt is bravely walking a tightrope above the abyss of bad taste. All Through The Night pulls it off, barely, thanks to a smart script filled with really sharp zingers courtesy of Gloves' collection of dubious friends. Gloves: Very good. Joe DiMaggio couldn't have done better. Sunshine: I used to bat .320 at reform school. The central character is good natured and only a bit shady, Gloves apparently a Broadway promoter of some sort but mostly interested in gambling scams. His background gives director Vincent Sherman and co-writers Leonard Spigelgass and Edwin Gilbert license to surround Gloves with wisecracking friends who provide a continuous stream of witty commentary on the evolving mess. A running gag features Barney marrying his girl Annabelle at the start of the evening, but unable to spend any time with the new bride because of the events of the wild night. Barney: Say, chief, can't I get away just long enough to give my girl a quick hello? Gloves: No, stick around, will ya? Starchie: What are you so nervous about? She'll keep! Barney: That's what you think. I can't take a chance. The fleet's in and she's defense-minded! On a more serious note, the film makes mention of the Dachau concentration camp, perhaps one of the earliest references in a Hollywood film to the Nazis' worst atrocities. And while the plot contains a large number of holes as the Nazis oscillate between dangerous and dimwitted, Sherman maintains brisk pacing on the cheap, limiting the action to a few sets and several hide-and-seek set-pieces with conventional gunplay and fisticuffs. Barney: I don't get it. I marry Annabelle and I spend my honeymoon with you. Sunshine: Well, I can cook. 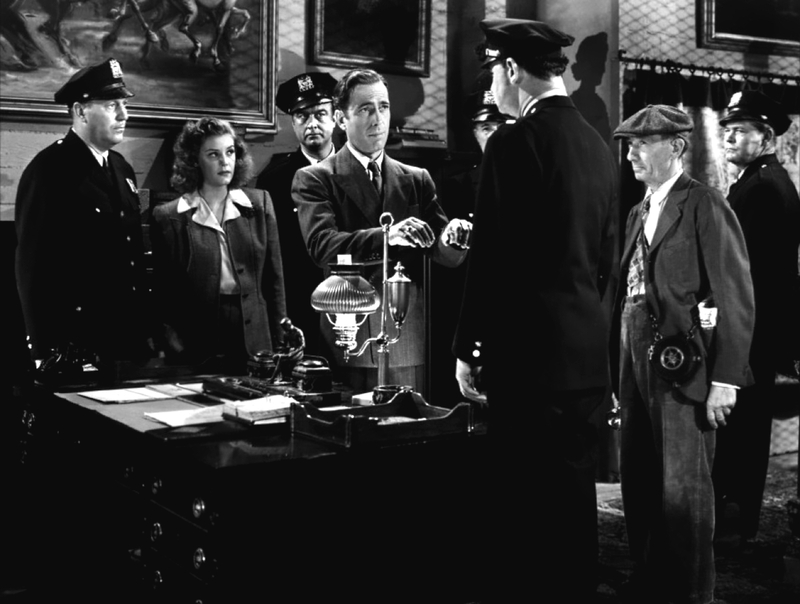 With Bogart injecting his confident swagger into every scene, this time emboldened by unscrupulous tendencies rather than personally-defined principles, All Through The Night is never less than watchable. Kaaren Verne is more than adequate as the damsel in distress who may or may not be part of the terrorist cell, and Conrad Veidt is as oily as bad guys come. The film features a large gathering of the Warner Bros. company of character actors, with Peter Lorre prominent as the the most cold-hearted plotter. Leda [speaking to gathered reporters]: Well, I also feel it's about time someone knocked the Axis back on its heels. Gloves: Excuse me, baby. What she means is, it's about time somebody knocked those heels back on their axis! Any film that gets away with that line deserves some recognition.